This is the review for a show called Khloe Kardashian. Sections of script from Tchekov's Three Sisters are projected onto a screen at the back of the smoke-filled stage. The sound becomes louder and more intense. Enter a man into a pool of light speaking monotonously and methodically into a microphone. He is dressed in a grey mouse costume. 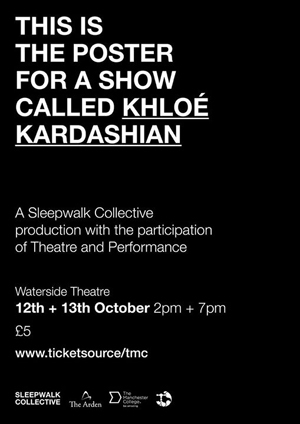 The Arden School of Theatre's students from the Theatre And Performance degree course joined forces with the internationally known 'Sleepwalk Collective' to bring about a one hour piece of theatre like nothing I have ever witnessed before. This specific course at Arden opens students up to a varying and wide range of performance styles, and has always encouraged them to push the boundaries of acceptability allowing the students to develop their own ideas and methodologies, erring on the side of non-conventional and what may be considered as more avant-garde theatre practises. This play was absolutely no exception, on the surface it was weird, bizarre, incoherent, methodical, languid and repetitive. However, underneath all of that was a work of incredible intelligence and skill, which wasn't just excellently presented but it was very thought-provoking too, challenging perceptions and asking many (perhaps unanswerable) questions. It was without a doubt one of the most fully-rounded, complete and professional productions I have so far witnessed at Arden. Taking as its starting point textual references and themes from The Three Sisters, the production, amongst other things, explores ides of life, death, belonging, living, being, and the us-watching-them-watching-us syndrome. Very cleverly developed, the text displayed on the screen sometimes was the mirror image of what the actors were doing or saying, and at other times they were diametrically opposed. Are we completely sure what is real and what isn't? says one character to the audience. All the cast play to, speak to and are aware of the audience, and all the time we are almost invited to join in, breaking the fourth wall, and answering back, but of course we don't, we couldn't (could we?). But it is these juxtapositions omnipresent within the play that are so fascinating. The actor v the spectator. The real v the false. The mundane v the bizarre. The text v the acting. The thought v the action. Masha; But what is the meaning of it? We should take from this play anything we can. For some it will not be much, for others there will be a whole universe of things to think about. It was confusing and yet singularly focused, and is something that perhaps you'd need to see a second time before really understanding it... if ever. And the reason for calling the show Khloe Kardashian is also a mystery. Perhaps it is that she is living in the shadow of someone more famous, and yet we still know who she is, her life is not her own, and yet her life is her own... one of the play's main themes! A diminutive bishop then asks us just exactly how much we know about the people we are sitting with, and then goes on to ask if we sometimes feel like our lives feel like a character in a play where every movement is watched and analysed - but they are the actors and so are the three sisters in Moscow, and their lives are no less real and everyone has the right to life and happiness because life is so ephemeral. We must live. There will be no secrets, but for now we must live. The cast of only 6 performers were all superb in this, along with the creative team of The Sleepwalk Collective. Although this style of presentation is not something I would normally be interested in, I found this one hour absorbing and entertaining in equal measure. And if you found this review confusing then it is deliberately so... however you have already got to the end of the review now, so you must have understood it! A man slowly lifts a large water pistol and shoots the grey mouse as snow falls. The sound grows louder and louder to a deafening pitch. A lady is seen clapping. Khloe Kardashian was performed by Paul Burke, Tristan Chadwick, Lily Rae Hewitt Jasilek, Sam Lowe, Frank McDonald and Kate Smith, and was directed and created by Iara Solano Arano and Sammy Metcalfe.